the Northern Worker: Open Letter: Free Leonard Peltier! 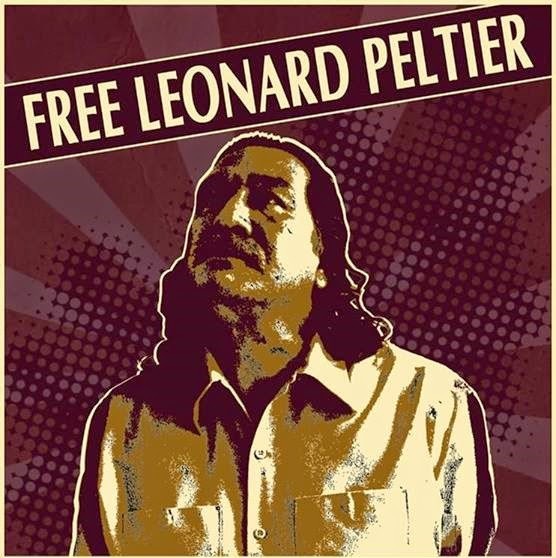 Open Letter: Free Leonard Peltier! In 1973 I participated in the Wounded Knee occupation for seven weeks. There I learned first hand of the reign of terror being perpetrated against traditional Lakota people who were demanding a modicum of civil rights and protesting both outrageous police brutality and violations of the Fort Laramie Treaty of 1868. From 1973 to 1976 over 66 traditionalists and American Indian Movement supporters were murdered and over 300 severely beaten on the Pine Ridge Reservation, which is also the poorest county in the United States. After attending the October, 1973 funeral of Lakota civil rights leader Pedro Bissonette, I was arrested for walking Pine Ridge streets after dark. I was held overnight. All my cash was taken as a fine and I was left on an isolated road on the reservation border in freezing wind and rain, in the middle of a war zone to hitchhike 500 miles home. Thirty days of jail awaited me if I returned to the reservation. Luckily the first car that stopped that day was filled with friendly Lakota elders, who rolled down the window and said "We thought you'd be here! Want a ride to Rapid City?" Leonard Peltier was not so lucky. Leonard has taken the rap for everyone involved. The FBI Cointelpro program was out to make someone serve prison time for the Wounded Knee occupation and its aftermath. Peltier was convicted of “aiding and abetting” the murder of two FBI agents during a shootout in the civil war zone/police state that was the Pine Ridge Reservation in 1975. How ironic is it that the two individuals Leonard supposedly “aided and abetted” were found innocent on grounds of self defense? At a 1995 parole hearing U.S. Prosecutor Lynn Crooks admitted again that no evidence exists against Peltier, but the parole board denied Peltier's request. Archbishop Desmond Tutu, Jesse Jackson, Mother Theresa, Robert Redford, Attorney General Ramsey Clark, and even Madonna are among over 10,000 individuals and groups who have called upon President Obama to release Leonard. June 26 marks the 39th Anniversary of the "Incident at Oglala", which was made into a film of the same name by Robert Redford. I do think 39 years is quite enough for someone who is innocent of any wrong doing to be in prison. Especially someone who is 73 with diabetes. Join us in bearing witness and vigil for Peltier on Thursday, June 26, 5-6 PM at the corner of Lake Ave/Superior St. There will be at least 50 commemoration events throughout the US and Europe. > The article above was written by John Iversen , Two Harbors, MN (enrolled member Bois Forte-Nett Lake Band of Chippewa).